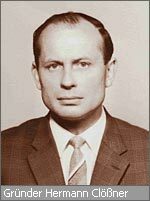 After leaving his business-partner in a company founded on April 1, 1964, which produced mainly precision microscopes, on August 1, 1971 Hermann Cloessner founded the present company in the garage of his own house. In the early years the company manufactured cutting and bending tools for the camera production, as well as devices for the optics industry. Later, milled aluminum parts for aircraft galleys were added. Along the way, production was relocated into a newly built manufacturing hall in 1973. In 1986 the founder’s sons, Ulrich and Wolfgang Clößner, took over the company. By that time the company already had 16 employees. Four years later, with the dedication of the brand new company complex at Leuner Weg 14, the company was ready to expand production. In 1999 an addition increased this manufacturing area by 500 square meters. The completion of a new 580 square meter material warehouse for raw material took place in 2006. The company expanded by a further 1300 square meters two years later. In 2014 we moved into the new office building. At present the company employs 84 skilled workers.